As Chief Surveyor and Head of Public Lands and Buildings, Chris Farrow has responsibility for managing the Government estate of over 2,000 acres and some 751 buildings, and this task incorporates a number of related genres including building surveying, facilities management, geomatics, project management, valuation, quantity surveying and more. Mr Farrow’s occupations in one of the many in public service, which encompass a wide range of varied fields and some of these posts are deemed hard to fill, meaning there’s a known limited talent pool with expertise in the specific area available on-Island and in some cases there could exist a global shortage of trained resources. The Minister for the Cabinet Office with responsibility for Government Reform, Lovitta Foggo, has stressed the importance of showcasing the Bermuda Government as an employer of choice for Bermudians. Keen to share his public service career journey in the hopes of inspiring our young people, is Mr. Chris Farrow, who is the Chief Surveyor and Director of Public Lands and Buildings for the Ministry of Public Works. Mr. Farrow, entered Government through the Public Service Bursary Awards Scheme, a programme that has supported many young Bermudians’ educational pursuits with a view of preparing them to fill essential technical and professional posts within the public service. “People often associate surveying with land surveying, but that’s only one of the many disciplines of surveying,” Mr. Farrow notes. “Surveying covers all aspects of real estate and individuals can specialize in a number of fields including building surveying, commercial property, facilities management, geomatics, project management, residential property, valuation, quantity surveying and construction to name a few. “As Chief Surveyor and head of Public Lands and Buildings, I have responsibility for managing the Government estate of over 2,000 acres and some 751 buildings. I work with a team of 155 staff and an annual operational budget of $20 million. The Government real estate uses are diverse and range from arable lands to a zoo with all manner of land and building uses in between. Mr. Farrow casts his mind back more than three decades to chronicle his public service career, noting that he began his studies to become a Chartered Surveyor in Sheffield, England. “It was over 35-years ago when I received my Bursary Award,” Mr. Farrow recalls. “The support went well beyond financial, it also provided the guarantee of employment over the holidays and upon graduation. In addition, I had an employer that was fully vested in my career development. “I started as a student within the Ministry of Public Works, interning in the Estates Section, working under the then Chief Surveyor, Mr. Frank Lund. 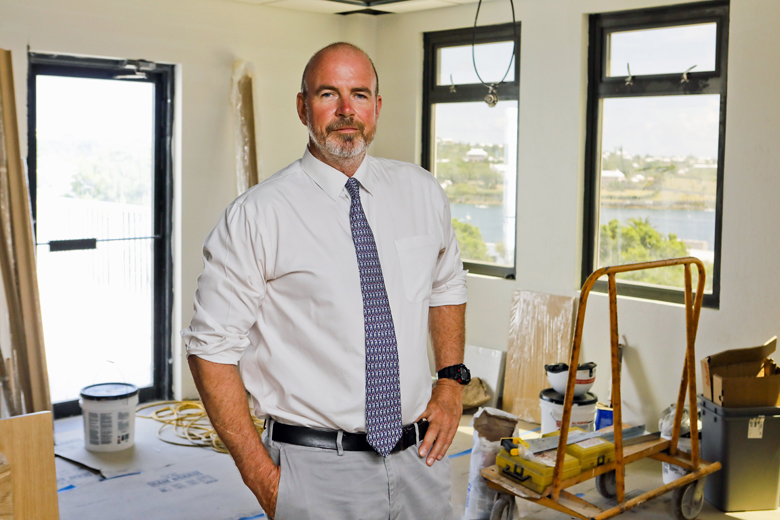 Over the course of my career, I was provided with mentorship and given very broad work experience including secondments to the Bermuda Housing Corporation and the Land Valuation Department. “After graduation, the Public Service Commission supported my pursuit of employment with the UK Civil Service in London to gain professional experience. I was fortunate to be accepted into their graduate programme, and spent four years in London working for the Inland Revenue Service in their valuation office. 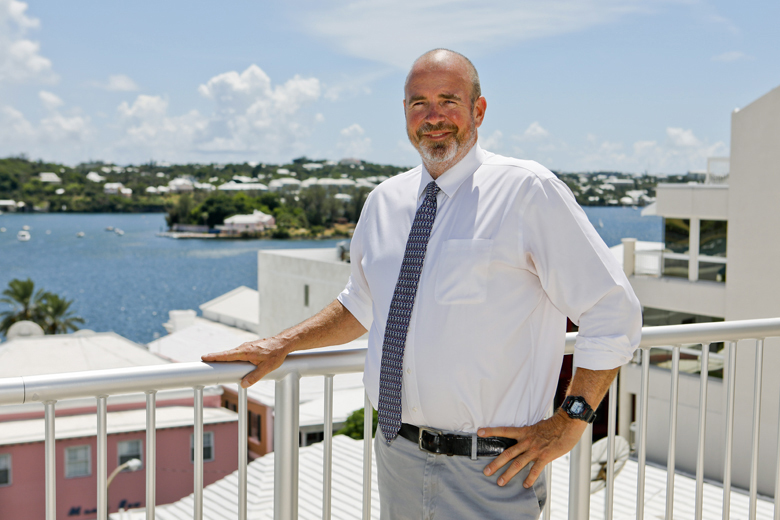 Mr. Farrow returned to Bermuda in 1991 and joined the Land Valuation Department. By 1995 he had been promoted to Director, and in 2013 he was promoted to the Ministry of Public Works as Chief Surveyor. During that time he’s had opportunities in other Government Departments, including serving as the Acting Director of Planning, the Acting Director of the Information Technology Office and a number of Acting Permanent Secretary posts. 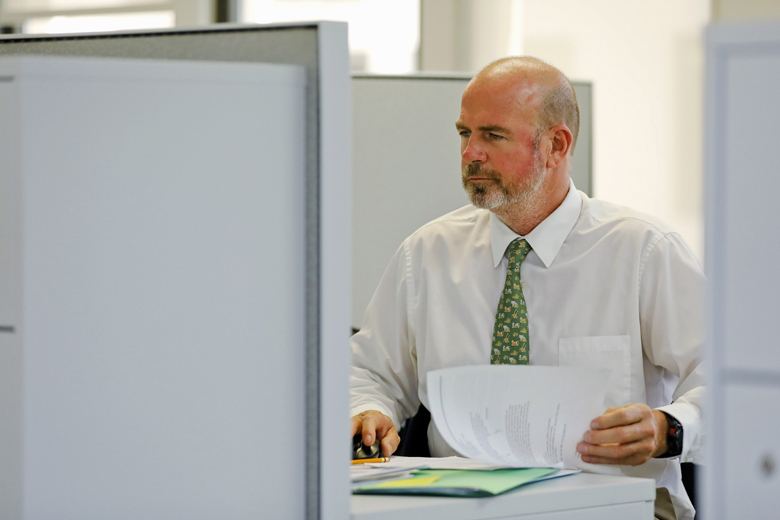 Mr. Farrow said he believes in the importance of life-long learning and career development. He notes that job training opportunities and guidance should be a cornerstone of any organisation, saying, “The learning never stops. Not only does my professional qualification require continuing professional development, but the public service provides many opportunities for further study and development. Mr. Farrow considers it his responsibility to support those young people who are currently navigating their career path. And he’s encouraging individuals who are looking for a unique and rewarding career opportunity to consider the public service. He concluded, “The Government has stated its intention to attract, develop, motivate, and retain a quality talent pool that is committed to the highest standards of excellence. Every year the public service advertises for bursary applications and within the Department of Public Lands and Buildings are particularly keen to bring on board students who are interested in Estate Management and Building Surveying. the Minister should be telling young people to go into the PRIVATE sector as the employers of choice for Bermudians. WTH is wrong with her? adding more to the taxpayers’ expense is par for the course for the PLP. Bermuda, we are doomed. VOTE THEM OUT. Obviously she means when a position is available. Not come a we will create a position. Her statement was to also highlight that there a many Bermudians employed by Government. So does govt own Devonshire Dock (on North Shore Road) or don’t it??? Finally someone not in the friends and family circle!!! You got in at the right time then. A bit like the housing market. Is this the department responsible for the Railway Trail bridge over Barker’s Hill? The planks of wood are steadily rotting and, as a frequent user, I would like someone to take a look to ensure it is still safe to use. I am not sure which Department to contact, if anyone will even answer the phone too. IS this the Department responsible for the old Railway Trail bridge over Barker’s Hill? The planks of wood are steadily rotting and being worn away. As a frequent user as I am sure a lot of people are, I would like to know if it is still safe to use. I was an individual who wanted to become a surveyor. I was accepted into the program by the college of Estate Management. I started to attend the land valuation department in hoping I could shadow to learn more about the role of a surveyor. I did shadow someone a few times. I was told that I was only allowed to shadow an estate surveyor (He was lovely by the way) but only for a short time. As a stipulation for me doing the course, I had to be guaranteed an internship position with an public administration before I could continue the course. I was told my a Woman ( I will not share her name because she has a lot loose if I do), that there won’t be any internship available for me.By the way, this same woman spoke about how she has had speeches about being a surveyor in Bermuda. She also express to me that the government needed Bermudians to filled this role because many foreigners are the ones who are running this department. I was glad to be offered this idea until it came down to actually honoring their word of offering to train me. So with that being said, please save the bull for someone who doesn’t know how this system operates. ****And By the way, I was someone who was willing to volunteer my time to shadow and be and intern all before it was offered this summer to summer students.